When we released the bulk of our initial “Fury of Solace” material, back in 2008-2009, fans were very actively interacting with the characters on Twitter, and that was an important part of the unfolding story. I actually managed to keep the Twitter accounts active for a decent amount of time after we had stopped releasing new material, but as our production on this latest cycle stretched out to multiple years, it became unrealistic to upkeep the Twitter accounts when no actual story was taking place. So the character Twitter accounts fell quiet, and we had a good amount of follower attrition. However, as we were gearing up for the release of this new cycle, I wanted to reinvigorate the Twitter audience, reach out to our old die-hard fans and get the Twitter pages jumping again, because that kind of Twitter interaction would continue to be an important part of our storytelling process as the show went forward. So we came up with a four-week Twitter prologue, concocting one major story point for each week leading up to our release, which would give the characters a talking point for each week, something to discuss and argue about, and to invite fan input as well. And not that this came as too much as a surprise, but fans don’t necessarily jump onboard for Twitter chatter alone. Some of our die-hard fans from back in the day did take part, however, and in so doing they reminded me once again just how smart and savvy our fans really are. Not only did they ask all the right questions, they even discovered character accounts that I have not to advertised in any way shape or form to this day. Back when we started the series, there were maybe four different character Twitter accounts. Now there’s about 5 times that many. And I’m trying to encourage organic discovery of these accounts to some degree. So, as mentioned above, some of the character accounts aren’t officially listed anywhere, they can only be found by fans who pay enough attention to the central cast to notice who those characters are sending @replies to. And even during the Twitter prologue, before we released any of our new videos, some of our die-hard fans proved just how much they were paying attention. We’ve actually introduced a few characters on Twitter before they’ve shown up on screen, which has been an interesting storytelling experience in and of itself. I know the folks over at “The Lizzie Bennet Diaries” have been doing that as well, to great effect. I was also able to use these Twitter plots to bridge some holes in the overall story. For instance, a large part of the story in the new “Fury of Solace” cycle centered around a warehouse owned by a company called Konig Inc. Konig Inc., we learned, was just a shell company with ties to Mason International, the “evil” pharmaceutical company that both Fury of Solace and Uroboros are attempting to take down. 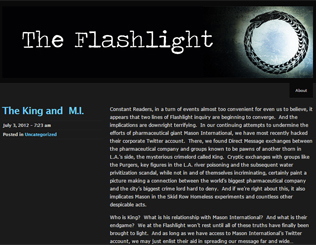 Now, Konig Inc. was first introduced into our story on Uroboros’ conspiracy blog, The Flashlight. But looking back at the old posts, when Uroboros first became aware of Konig Inc., he didn’t realize it had any ties to Mason International at all: at the outset, Uroboros was interested in Konig because it was one of dozens of shell companies allegedly owned by a mysterious crime kingpin called King. The writers and I knew all along that this King was ultimately going to be linked to Mason International, but it occurred to me that that connection was not officially established in any of the videos we had planned. So I devised a way to link the two in one of the stories from the Twitter prologue. One week of the prologue centered around Uroboros hijacking the Mason International Twitter account and using it to dispense some of the pharmaceutical company’s harmful secrets. Since Uroboros wasn’t going to come into his own as a central character until our new cycle was released, the primary purpose of this Twitter story arc was to bring Uroboros into our audience’s consciousness by allowing him to interact with some of our more established characters. But I realized I could kill two birds with one stone. If Uroboros gained access to the Mason International Twitter account, he would also be privy to the company’s private direct message exchanges. And it occurred to me that this was our best opportunity to connect Mason International to King and his criminal empire. After Mason International regained control of their Twitter account, Uroboros reported that he had seen DM exchanges between the pharmaceutical company and factions that were known King collaborators. And that important story connection was thereby made! And I of course chronicled the entire event via storify so that it could be referenced back to as part of the ever-evolving narrative of the show. In this last case, we were able to make the Twitter chatter not only relevant to the plot, but actually integral to it, and this is something I’d recommend doing from time to time if you can swing it. Fans will be all the more likely to engage in social media discourse with the characters if they know that it will sometimes put them in a position to learn key plot points before the rest of the world. But, admittedly, you have to walk a fine line with this: A large percentage of your fan base are going to be casual viewers who only watch the videos and aren’t particularly interested in delving into the transmedia experience, so it’s important that you find a way to convey to them any off-screen developments that are necessary for them to understand the overall story. In our particular case, we used a storytelling device I introduced in an earlier post as the “third-person narrative,” a short paragraph or two of written text that accompanies each live-action episode, to contextualize it, and link to relevant supplementary content that enhances the viewing experience. That’s going to be it for this week, but stay tuned for a new post next Wednesday!